If its demands are met, the historic teacher strike in Los Angeles has the potential to upend union orthodoxy across the United States. Originally published by Roar Mag. Written by Jared Sacks. Depending on one’s capacity for optimism, 2018 either foretold the rebirth of labor militancy in the United States or, conversely, suggested the last gasp of a movement that has been in near-terminal decline since the 1970s. Two key events took place last year, which, per one’s analysis, have led to opposing predictions for workers in the US. First, in February 2018, after years of austerity under Republican control, West Virginia teachers and school personnel decided to go on strike. But this was no conventional work stoppage. In West Virginia, teachers are considered providers of “essential services”, making any strike action illegal. Of course, this is part of the reason why neoliberal politicians have been able to walk all over the backs of West Virginia teachers for decades, making them third-last in the nation in terms of pay. However, it also did not help that their unions — the American Federation of Teachers, the National Education Association and the West Virginia School Service Personnel — were all dead set against any risk-taking, never mind an illegal disruption of work. But against all expectations, West Virginia teachers captivated the nation when they decided to go on strike nonetheless, drawing inspiration from a long history of radical strikes in the state’s dying coal-mines. Their wildcat action brought out over 20,000 teachers shutting down schools in all 55 West Virginia counties. This turned public opinion against the government — instead of no pay increase at all, they ultimately won their “impossible” demand for a 5 percent pay raise. Immediately, an organizing wave erupted throughout the nation, including follow-up actions by teachers in Arizona, Oklahoma, Colorado and North Carolina. Then, a second key event took place: in June 2018, the US Supreme Court ruled against workers in the landmark case Janus v. AFSCME. The ruling, which had been pushed by conservative advocacy groups, including those affiliated with the billionaire Koch brothers, reversed the 1977 Abood v. Detroit Board of Education decision which allowed labor unions to charge agency fees to non-members who benefited from the contracts unions negotiated on their behalf. Labor unions argue that such agreements have proven essential to preventing the common “free-rider” problem. Post-Janus predictions were grim. The largest unions in the nation, like the SEIU, UAW and NEA, estimated a loss of tens of millions of dollars as well as between 10 to 30 percent of their membership. It was feared that this was the beginning of the end: emboldened conservative NGOs, they believed, would try to ram through further anti-union legislation, expand their “fake news” propaganda, and make it nearly impossible to organize in the workplace. 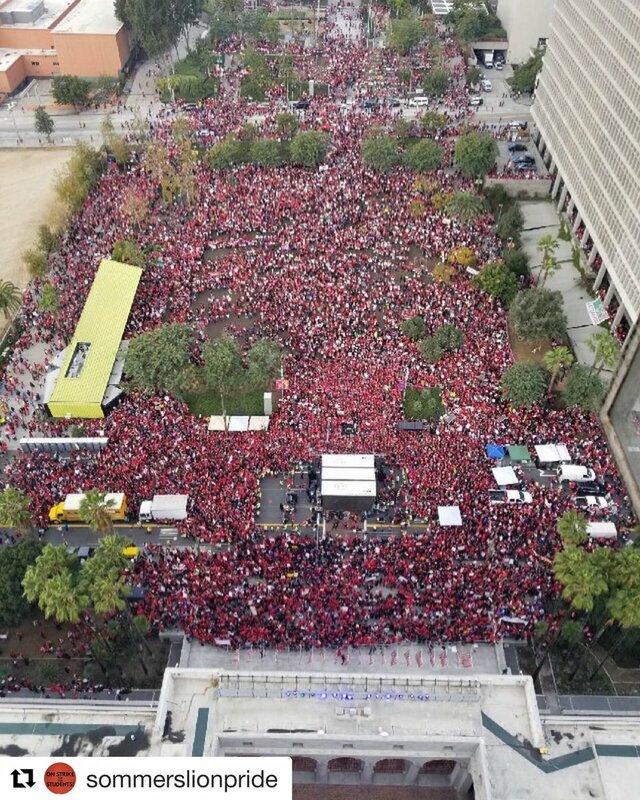 Fast-forward to January 14, 2019 when an insurgent progressive caucus which took over United Teachers of Los Angeles (UTLA) a few years back led its 32,000 members into the local’s first strike in 30 years. UTLA represents teachers in the Los Angeles Unified School District, the nation’s second largest, as well as teachers in a small number of local charter schools. Protesting outside Westchester High School this past Monday morning, only one teacher ROAR spoke with had ever been on a picket-line before — that was during their previous strike in 1989. Yet, despite the Janus decision, not a single Westchester teacher had gone to work that day, turning the school into a daycare center for the roughly 80 students who showed up. Later in the day, a massive rally took place downtown. Police conservatively estimated that the crowd consisted of at least 20,000 teachers, many of whom had brought homemade signs, and brass bands to liven the atmosphere. Community support was extensive: food carts were selling hotdogs at a special discount for protesters and many passing cars honked in support. This is when it became clear that something unconventional was afoot. What had happened to the so-called free-rider problem which was believed to devastate unions like UTLA? UTLA president, Alex Caputo-Pearl, has described their approach to the strike as “bargaining for the common good.” Emerging out of a progressive caucus that was a strident critic of previous union leadership, Caputo-Pearl has foregrounded non-traditional demands, including a significant reduction in class sizes, the hiring of thousands of new teachers and auxiliary support staff such as social workers, the reduction of standardized testing, as well as other demands which are aimed at improving students’ education. Beyond this, UTLA’s new leadership has also cultivated ties with more radical community movements such as Black Lives Matter and anti-ICE immigrant activism. Yet, what makes this strike different, at least in the context of highly depoliticized corporate unionism in the United States, is the way UTLA is using the strike to force the school district to end its support for charter schools. For years, union bosses have argued that school privatization is simply not something that can be bargained over at the negotiating table. But Caputo-Pearl and his team have shown that this is simply not true. And even if they do not put a moratorium on new charter schools into their next contract, UTLA is using this strike to turn public opinion, setting the stage for the election of anti-privatization candidates to the LAUSD school board and a possible ballot referendum to expand school funding. Since the strike began, support for UTLA demands among LA residents has actually increased from an already firm 60 percent to a whopping 80 percent. It looks like a combination of social justice unionism and direct action is having a far-reaching political impact well beyond the bargaining table. There is no question that there has been an escalation in worker organizing in the US both within and outside unions over the past half-dozen years. Rank-and-file workers are becoming progressively radicalized in response to the state of the economy as well as due to the wider influence of post-recession social movements like Occupy, Black Lives Matter and the Fight for $15. In this light, one could argue that the Janus decision does not only signify the death knell of “workerism” in the US; much more than that, this massive legal loss for workers has actually turned out to be a bane for the kind of complacent “business unionism” that has come to define the American labor union. Janus is forcing union leadership to listen to their rank-and-file, to take workers’ thought — to use Sylvain Lazarus’ phrase — seriously. If they do not, the outcome will be either the loss of members refusing to pay the salaries of complacent leaders or, as we see in UTLA, an insurgent form of workerism linking “factory and society” and forcing the labor establishment to give way to a new kind of radical worker politics. UTLA is the first indication that the end of agency fees can actually reorient union politics back to its base. So, perhaps, we should send a thank you letter to the Koch brothers after all.